As marketers, you want to get inside the minds of college women and understand what makes them tick--what do they care about, what gets them amped up, what makes them laugh, what makes them cry, what drives them, what do they want? We thought, what better way to deep dive into the millennial subconscious, the stuff they’re actually feeling and thinking at their core of cores, than to turn to the most millennial expression of the psyche there is--memes and gifs. So we analyzed thousands of social posts to find the ones that resonated with them the most--that they couldn’t help but like, share, and comment on, because the feeling or emotion expressed in that post was just so. spot. on. 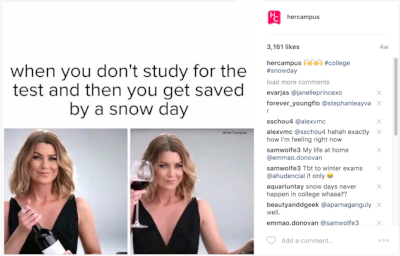 So let’s take a psychographic look at the 2017 college woman, as told by Her Campus’s most viral and best-performing memes and gifs. Or to drag yourself away from your social life--or, if we’re being honest, Netflix--to get your schoolwork done over the weekend. Needing to do your schoolwork over the weekend is punishment enough, but tests are the devil. And the only thing worse than a test is a final exam. But to just take what may appear as apparent laziness at face-value isn’t really fair. Because these women are facing a lot of pressure. Even though they might do the best they can to make it seem like they have everything under control. But if college is supposed to be “the best four years of your life”, where does all this stress come from? For one thing, they’re not sure what they want to do with their lives, and they’re a little overwhelmed trying to figure it all out. And they feel a lot of pressure to live up to others’ expectations--and their own. Because no matter how hard you’re working, it’s hard not to feel sometimes like you’re falling short. And like you just keep screwing up. But not really. Because they can tell there’s clearly a difference. Aside from career pressure, figuring out their love lives is complicated too. But luckily they don’t take themselves too seriously in the romantic relationship dept. Because when it comes down to it, who needs guys anyway? These women have higher priorities. Speaking of money… they’d like more of it. But these women are also enlightened enough to know that you only live once. So they’ll find room in their budget for the things--and stores--they love. Life as a college woman in 2017 can be tough. But they get by with a little help from the sisterhood. And their ride-or-die crew is their world. Because everything will be ok as long as you’ve got your besties.